Since when did brunch become “a thing”? I’m not complaining – in fact, I applaud this interesting love-child of breakfast and lunch. A little like afternoon tea, there seems to be a sense of occasion involved in “doing brunch”. 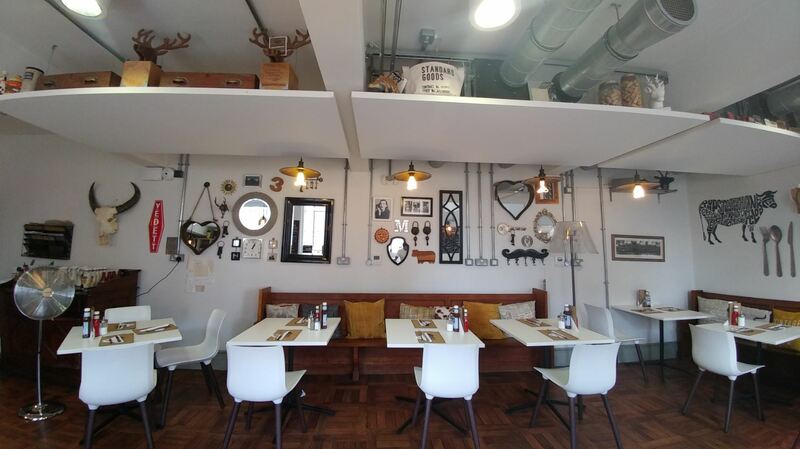 Eateries up and down the country have been fast to jump aboard the brunch-express, and HIDE Burger Bar is one such eatery in Derby that is now flinging its doors open to welcome brunchers. It was the weekend, and after another busy week, I was looking for some much-needed time-out. And with the tropical clime of late (the volcano-hot weather always accentuates my lethargy), I was in the mood to “just be”. I found myself in HIDE Burger Bar on a Saturday afternoon. It was 1pm, I was hungry-ish, and I couldn’t wait to get stuck into brunch. 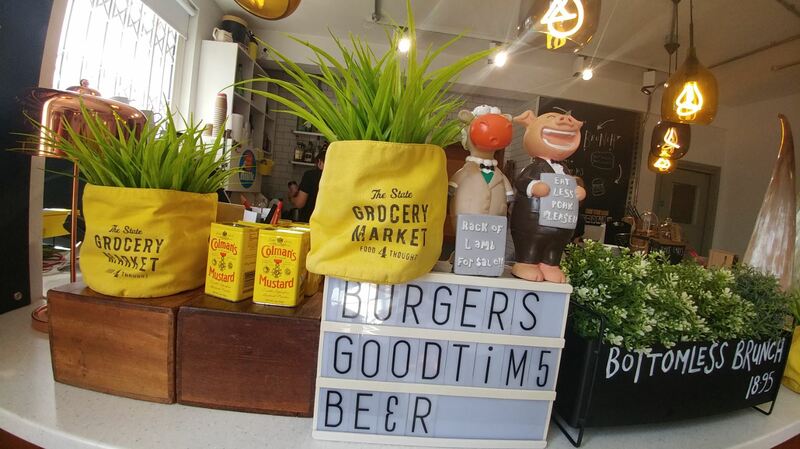 Light, airy environ, chilled music, cutesy memorabilia lifted my spirits right away. The animal skull prop was fascinating and simultaneously edgy. Much like coverage of the Paul Manafort trial due to commence this week, it is difficult to look away, because it has grabbed your attention. Filled with nick-nacks on ceiling shelving and throughout the room, the vibe is chilled and relaxing. And that is the thing with HIDE Burger Bar. Despite its city centre location, it doesn’t feel like it is in the city. It is away from the hustle and bustle of city life – and for that, I love it all the more. I spied an elderly lady duck in, order a soft drink, stay for around five minutes, glance at her watch then peek out of the window, then walk leisurely outside, where her bus had just pulled up. 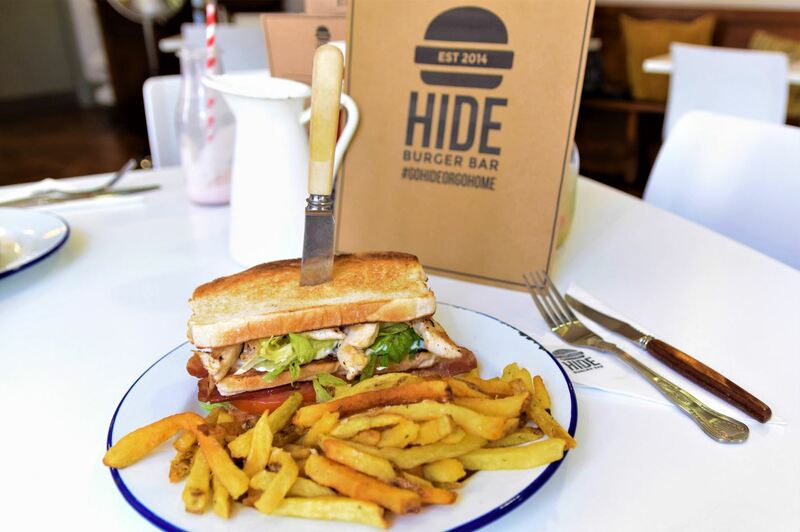 I found myself rather envious of her – apart from her impeccable timing, HIDE Burger Bar is a fantastic pit-stop where you can get quick service, have a swift drink and within 1 second of leaving HIDE Burger Bar, board your bus because you can see it from the café window. The brunch menu is compact yet comprehensive. 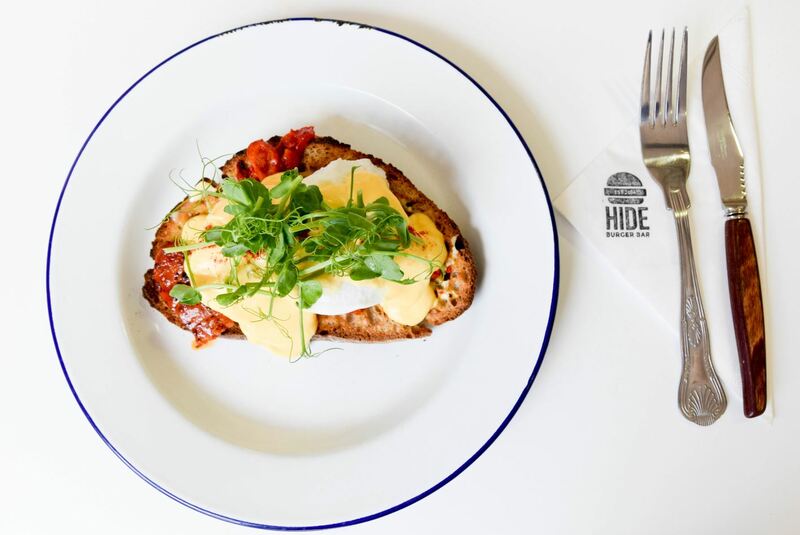 From soft scrambled eggs to salt beef hash and avocado toast, it is easy to visit HIDE Burger Bar every weekend for a few months and not get bored by the menu as you explore various dishes. My Chicken Club arrived with a flourish. It was tall, making its presence known on the plate, with an adoring crowd of rosemary salted chips. It was a delicious sandwich. Oxymoronic pillow-soft bread that still held its shape was the brilliant bready bookend to tender marinated chicken. Crispy shards of bacon provided a welcome salty punch, whilst the tang of mature Cheddar brought the whole dish together nicely. I love word-play, so the Eggs Benekick had already intrigued me before I had laid eyes on the dish. Perfectly poached eggs, medallions of spicy chorizo and squidgy roast red pepper, all enrobed with a luxuriously creamy hollandaise was a joy to look at and tuck into. The sprinkling of smoked paprika gave this dish a surprise earthy edge, which also brought a pop of colour to an already colourful dish. From the whisper of subtle spices from the chicken marinade, to the salty bite of the bacon, an American style IPA works wonderfully well with this dish. I recommend the Jaipur (Thornbridge). American hops are in abundance here, with a potent citrus finish. It feels thirst-quenchingly good, and will leave you sipping more, such is the smoothness of this beer. This dish has some punchy flavours, and a drink that cuts through the creamy canvas of the eggs, hollandaise, and the piquant chorizo is much needed here. Darley Abbey Cider is my drink of choice with this dish; crisp apple notes and clean finish of this cider marry well with the multi-faceted flavours of this eggy delight. There are also a number of very good non-alcoholic drinks too. 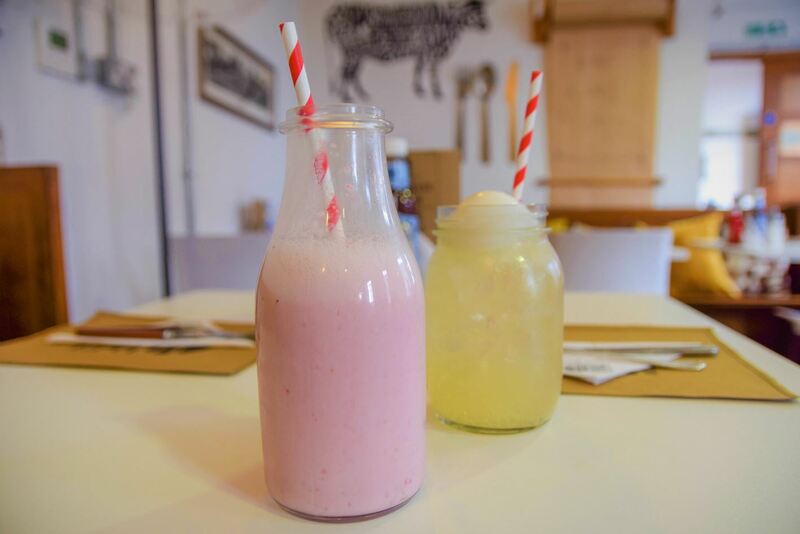 If dining with minors, strawberry milkshake and home-made lemonade with sorbet float also make great companions to these dishes. HIDE Burger Bar is a place that should be visited, and that too frequently (they do good coffee too). Service was efficient, my Chicken Club was faultless, and the space, oh the space is just lovely to be in. 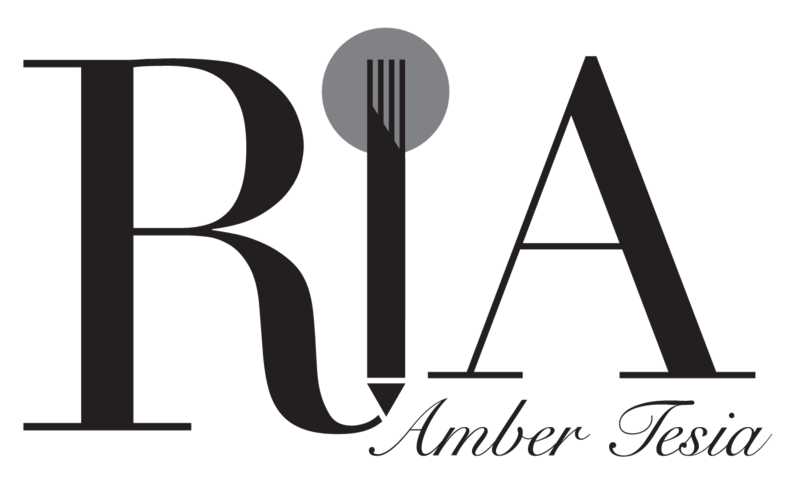 I will be rocking up very soon for a spot of lunch and an afternoon of blogging. Quietest table: bench seating in right hand room, open during evening service. Whilst in the area: Pop by River Derwent with a loaf of bread to feed the ducks.